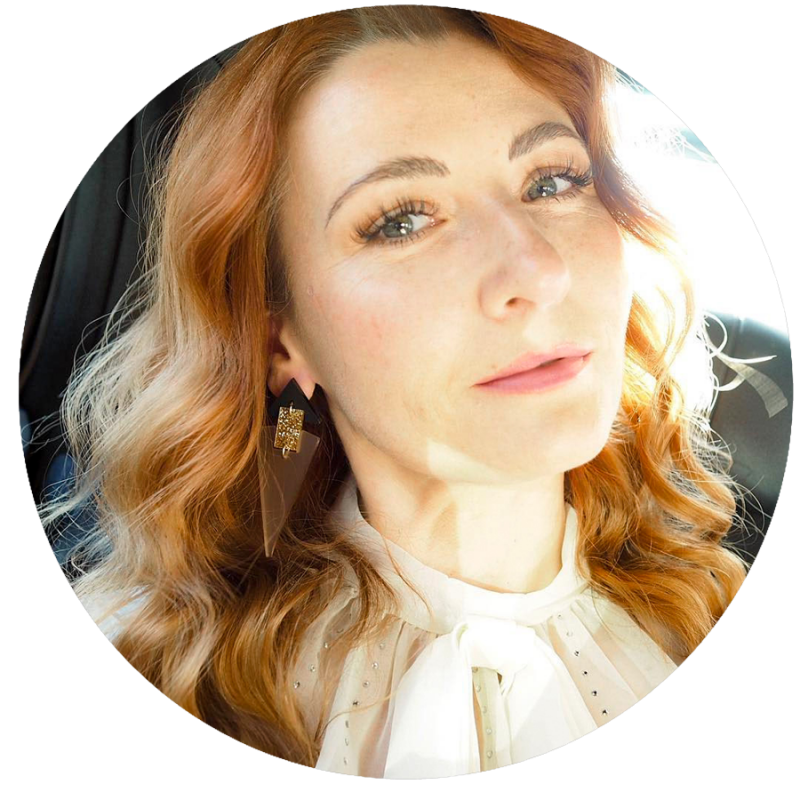 Last week I spent two days in Amsterdam – it was half business, half leisure, and I had the most fabulous time. 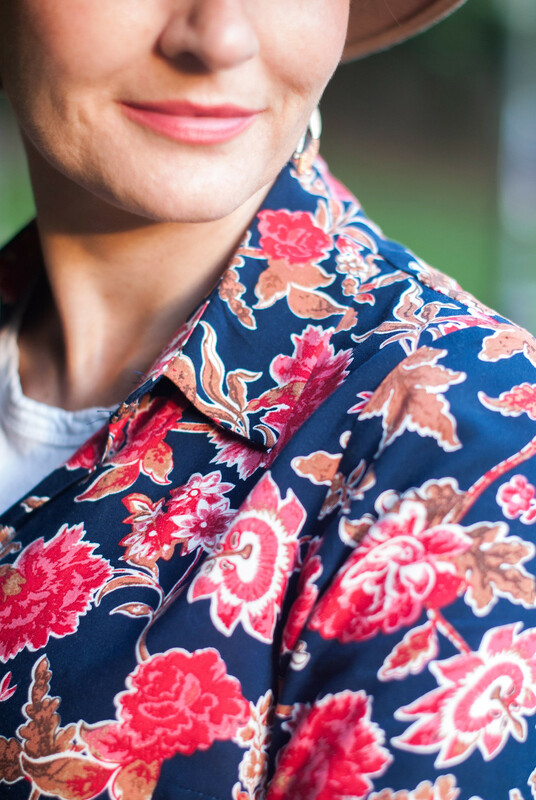 Friday’s post explains why I was there for business… today I’m talking about the outfit I wore on the second day for the sightseeing part of the trip (and on the plane home)! 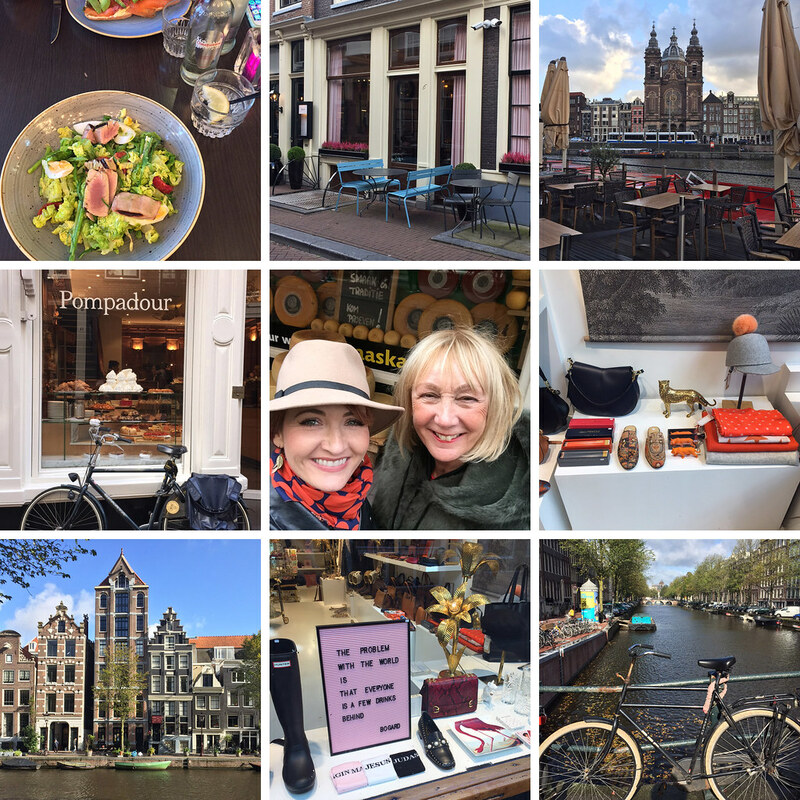 I’ve created a little collage of the lovely day I spent with Greetje – scroll down to see the snaps I took. She showed me all the interesting small shops and boutiques (it was nice to avoid all the chain stores) and we ate delicious food in equal measures of healthy and naughty and took several tea and coffee breaks. The weather was predicted to be just about the worst you could possibly imagine: 50mph winds and pouring rain (not a good start). Although it was pretty bad in the morning, by the time met and had had our first cafe stop it actually brightened up and we enjoyed lots of sunshine with just a few short showers in between. Sunshine on a day you’re not expecting any at all is just the best type, isn’t it…? I photographed the outfit properly at home over the weekend because I just wanted to enjoy my day with Greetje and not worry about having to get outfit photos done. 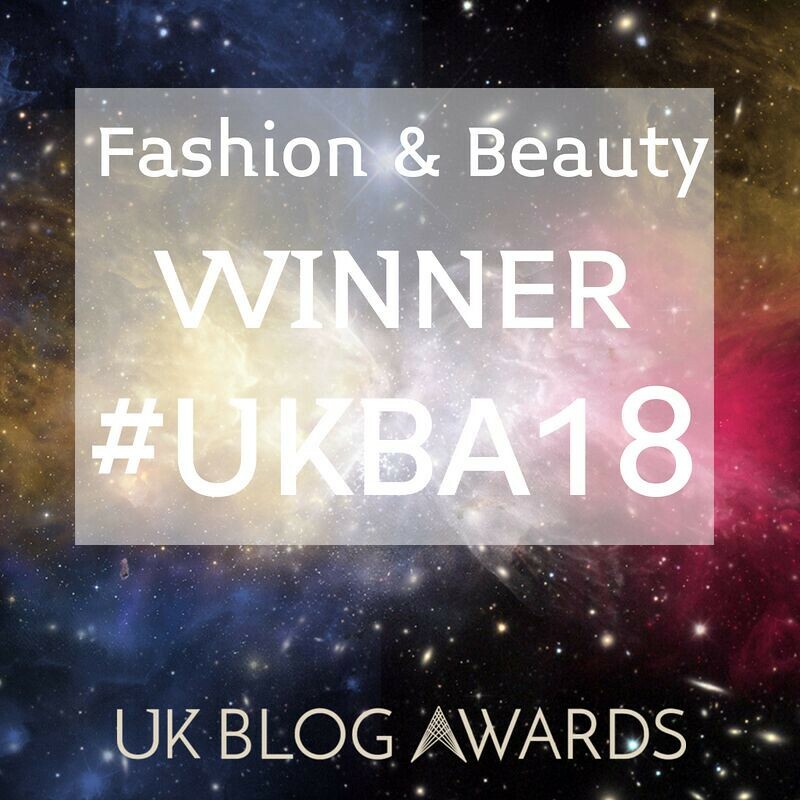 However, those of you that follow her will know that a blog post about our day is bound to pop up on her blog before long – it’s only a matter of time, I can feel it! 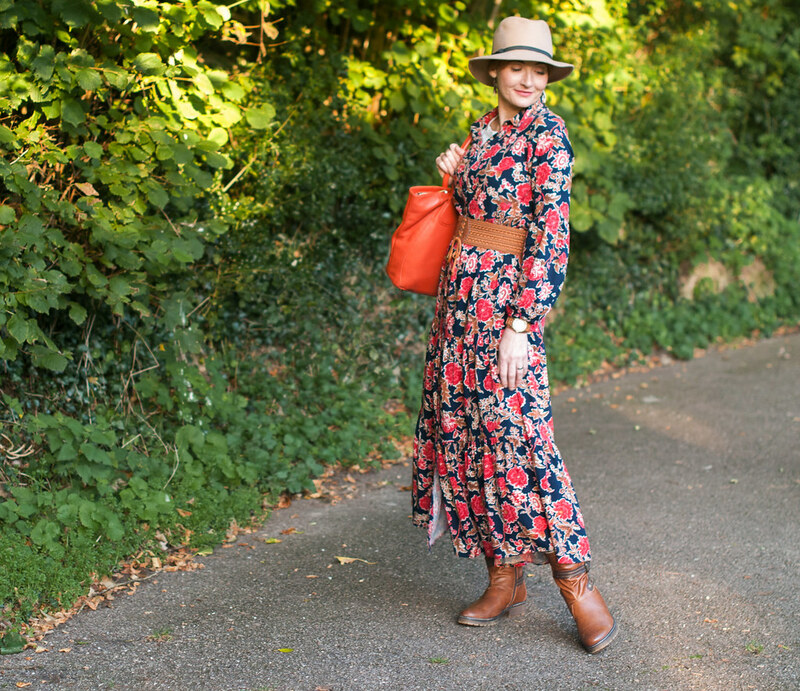 If I could justify buying several more floral maxi dresses I would – they’re so easy to wear at this time of year. 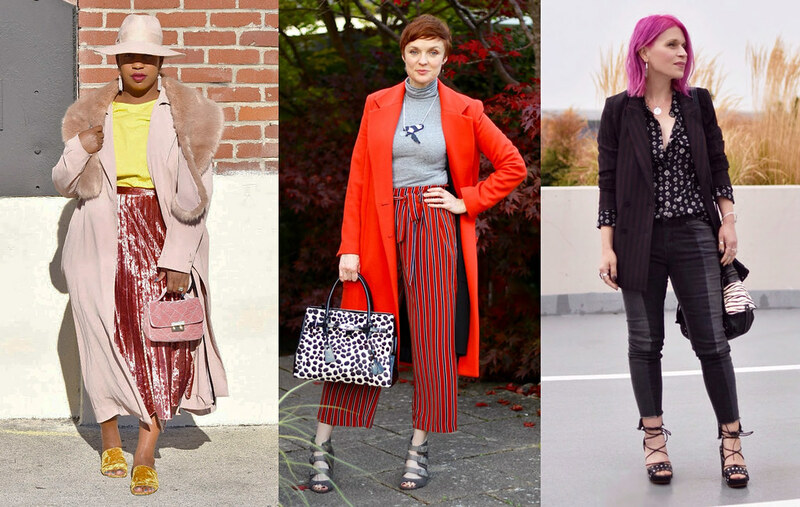 You’re comfortable, you’re warm (just layer up with long sleeve tees or roll necks underneath) and you’re not in need of heels to make the dress work (unlike midi dresses which, on me, benefit from heels). 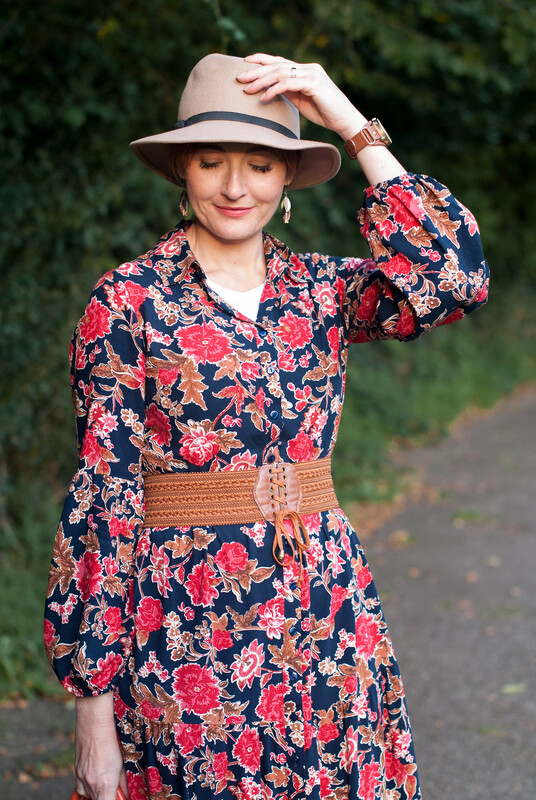 This floral maxi dress is the hero piece from the JD Williams video I’ve recently appeared in and it’s currently on sale (bonus!) – though judging by the positive reactions I’m getting about it (for example a young chap complimented me on the dress as we were boarding the plane) I think you need to move FAST if you want one. If you miss out on your size don’t fret, I have several more options at the end of the pictures. 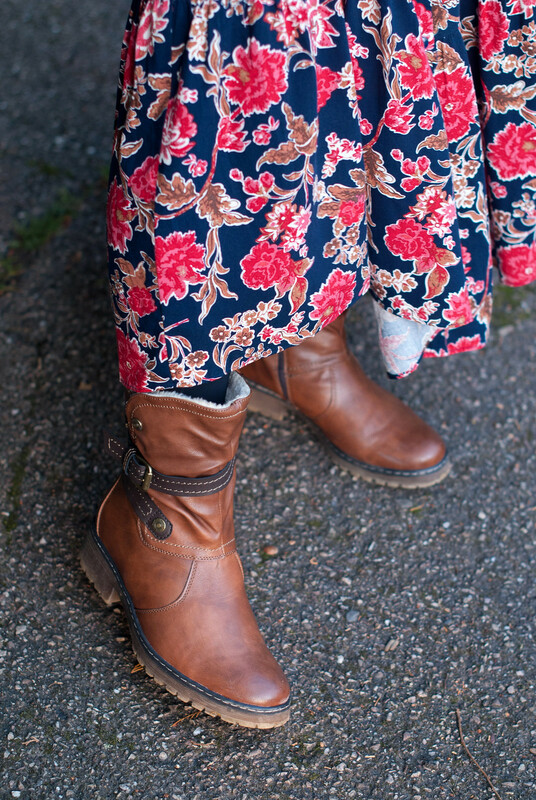 The other part of this outfit I love is the footwear: introducing my very cool tan ankle boots. I usually go for knee-high boots but thought I’d try some ankle boots that don’t have high heels for a change. And OMG how I love these tough-looking beauties! 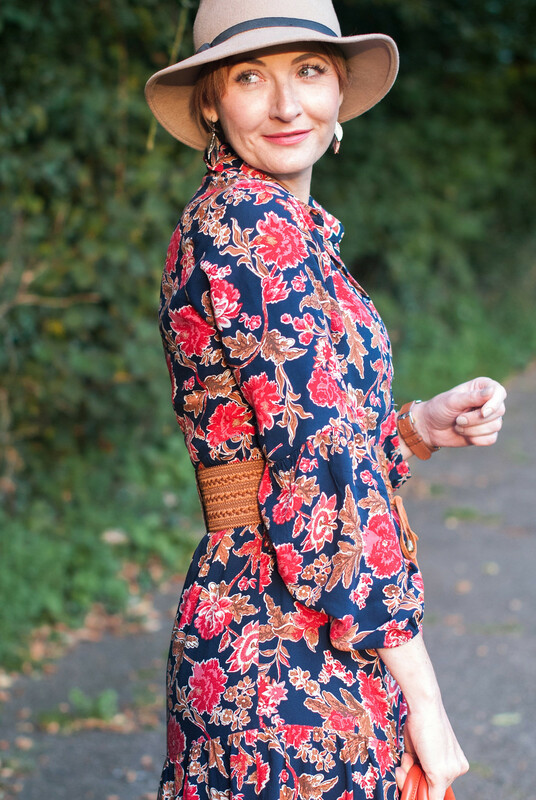 Equally perfect with a maxi dress or trousers (skinnies, boyfriend jeans, peg legs), as with pretty much all Lotus shoes they are supremely comfortable. They’re great for walking the dog, doing the shopping, travelling on a plane or having a day out in the city (I’ve done all of the above in them). YOU DON’T HAVE TO LOOK LIKE A TOURIST EITHER, BUT DRESS TO PLEASE YOURSELF. ALWAYS. The finishing touches for the outfit were the tan belt to give the dress some shape and tie in the colour of the boots, a fedora to keep my hair from going scarecrow-like in the galeforce winds and my biker jacket and vintage scarf (I decided not to photograph it with them back home as I didn’t want to cover up the dress). I think it’s safe to say I wasn’t dressed like the locals – I was a little too colourful (even with a black jacket!) to blend in. But I like that; I don’t think when you go to a city you need to look like a local. 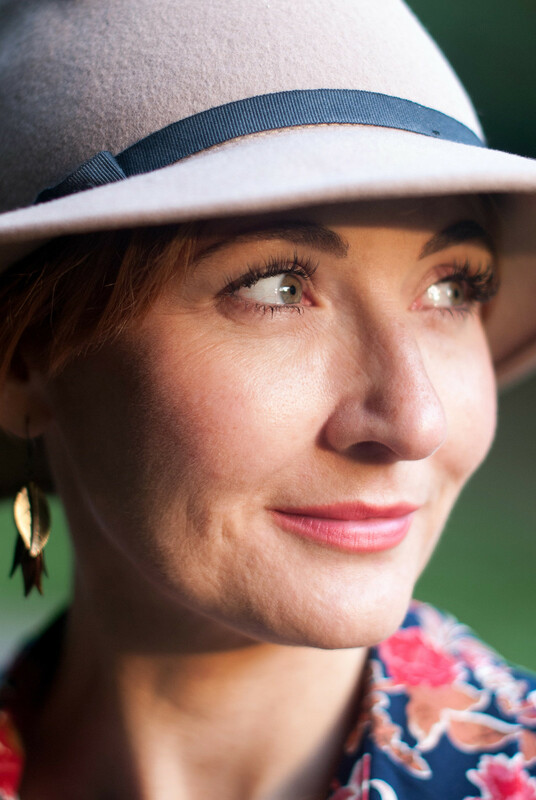 I often hear women who say they want to dress like the women in Paris, for example, when they go there to blend in… I always think the opposite. You don’t have to look like a tourist either, but dress to please yourself. Always. WHAT’S YOUR GO-TO OUTFIT FOR A DAY SIGHTSEEING OR PLANE-TRAVELLING? COMMENT BELOW, OR TAKE IT TO TWITTER @NOTLAMB! Above: All the things we did and saw, from the (utterly fabulous) shops and cafes to the canals and bicycles (of course!) to the food – both healthy and naughty. Greetje is the most fun ever and she kept me laughing ALL day. What a fun trip that must have been. I love your dress and chic but casual style for the sightseeing day! 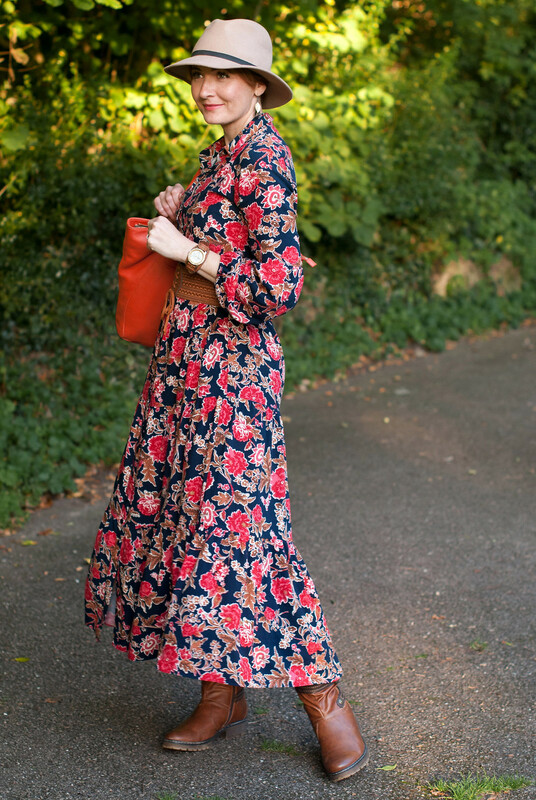 I really want a floral maxi dress that I can wear in the winter months and now seeing yours, I really want one. Fabulous post! 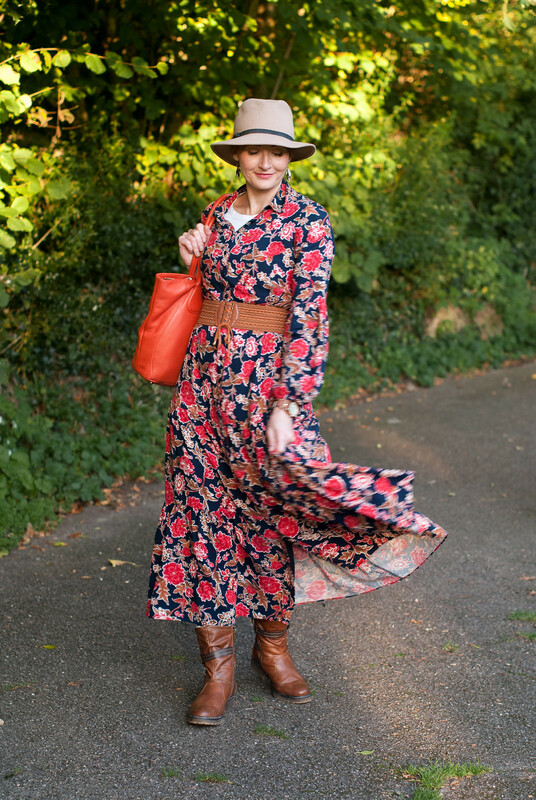 Don't you just love a maxi dress! They are so easy, just put it on and you're ready to go. Love how you belted it Catherine. Thank you for hosting. A day with Greetje? Oh, what fun! I don't doubt you had a blast together since I had the privilege of spending time with her when she was in Vancouver for a meetup. I agree about dressing for yourself when traveling too. Yes, I see that Ralph Lauren there. Hahaha. Looks great. I ended up putting together an outfit today that was influenced by this one. You might not think so on first glance, but the influence is there. I like the fact you stuck with what pleases you! Love the dress you are wearing! How lovely to got to meet up with Greetje again and on her home turf. Always travel in comfort and you'll arrive, fresh as a daisy! Thank you very much for the lovely feature this week!! Yes, I saw the taster of your trip on instagram and could see you ladies were having a lovely time. I'm sure Greetje is the perfect host. I do love your entire outfit Catherine and will have a lookout for something similar next time I'm going charity shopping. 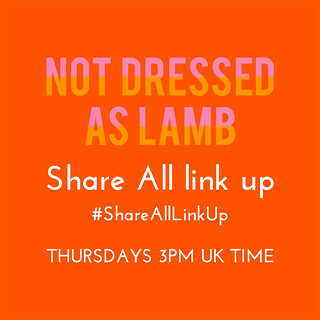 Thanks for the link up party! Oh yes, a blog post of our lovely day together will pop up. But has to wait as I have a few others planned first. And like you, I want to make some proper photos of my outfits. My hair looked like straw or rope that day. Never mind, we had such a very nice day and that is what counts. 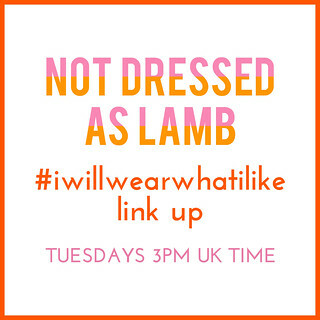 I am linking up and as usual will link back next Sunday. 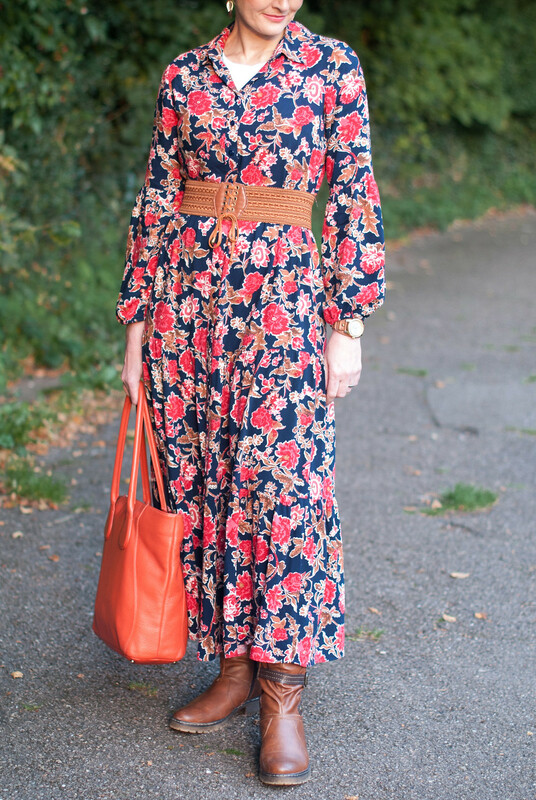 That maxi looks fabulous on you! I so agree with you about travel clothes! I love to dress up when I travel. Why not? Talk about great photo fashion shoots! You look absolutely fabulous, Catherine! And it looks like you had a fabulous day out too. Those boots are simply divine – plus warm, comfortable looking and perfect for touring around and seeing the most of a place without worrying about sore feet. I love the 70s vibe you have going. And thanks for sharing photos of Amsterdam. I always think that rain heavy clouds make for great photos, even if they sometimes mean you have to go inside for a cuppa – not a bad thing!! Thanks so much for hosting! Have a great week. 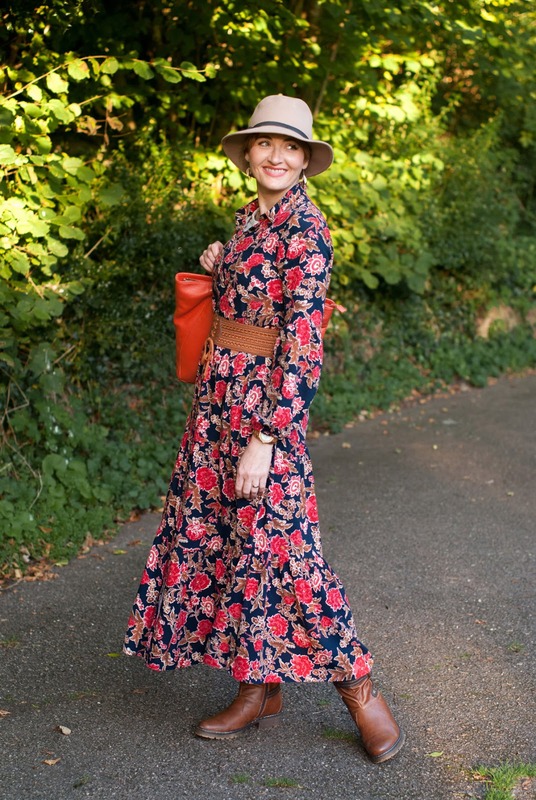 I adore the 70’s/RL/boho vibe as it’s one of my favorite trends. Thanks for sharing your exciting weekend and for wearing what you like. I love the idea of not so much blending into where you are visiting! It's only taken me 50 years to figure out that we should stand out! !